"Looks to me like he was a nice horse once," I remarked. The woman glanced over. "You're right," she fired back. "Imported from Poland. Good pedigree. No papers." I took one more look. I was struck by how this horse - emaciated as he was - could still float along the fence, head and tail held high. He seemed excited that strangers had come to this dismal place. The horse had no shelter from the intense southern sun. Fragments of fences defined his space. A discarded porcelain commode served as a lawn ornament among overgrown weeds. Only later would I discover that the horse starved for something more vital to him perhaps, than the feed and hay he so badly needed. But we had come to get some business done; to have the woman sign some papers. She even used the "skinny grey horse" as a landmark to help direct us to her place. Imagine that. Once we got what we needed, my husband, three boys and I climbed back in the truck and quietly drove home. A couple of months passed. Then late one evening, the phone rang. It was the woman. "You know that grey stud horse you saw when you were over here?" "Well I'm giving him away. I can't afford to feed him anymore. Know anybody who wants him?" I thought to myself. Who in the world would take a pitiful horse like him? He has no papers. He's nearly starved to death, for Heaven's sake. "Well I guess I could make a few calls," I offered. "Do you know anything about his pedigree?" I listened and took notes as she named his sire - Palas. Dam - Dunkierka. Foaled - 1984. He was once worth a fortune, but his papers were lost, the woman said, because of a bad debt. An owner way back never paid up, and the man who holds the papers probably won't give them up. And oh, by the way, she added, "He's got a hock injury and isn't broke to ride." After a pause I asked my last question. "And what's his name?" "Lech," she answered. "Lech PASB." I hung up the phone and hung down my head. Poor old fellow, I thought. Here he's starving, and who knows what kind of medical shape he's in. He can't be ridden and has no papers. About all he's got going for him is the fact that he's still a stallion. Well that was something. But without proper registration, he's nowhere. And then I thought again. "No horse deserves to live like that," my conscience informed me. So I'd have to take a risk and figure out whether this was just another horse story, or if the woman was telling the truth. Other obstacles kept me from keeping this unfortunate creature at our modest place: my husband and I both had full time jobs; three kids; and another stallion. And so began the work. The old journalist in me drove my efforts. A powerful gut feeling fueled the fire. I knew that even in as rotten a shape as he was, this horse was somebody special. I knew he wasn't conceived by accident. 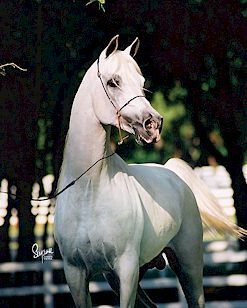 But who in the world would know about imported Polish Arabians? I certainly knew of no one. I had never thought of my back issues of AHW as research tools, but now they became my best reference. I looked up a feature on Polish Arabians, *Emanor, and his trainer - a man named George Zbyszewski. Back to the phone. "I remember that horse!" He cried. "I remember his dam! She was hot - wonderful mover. I saw them at Scottsdale years ago. Lech," George said. "Yes, I do remember him. I saw him in the long lines." Well that does it, I figured. I'd better go pick up this Lech fellow. There we were again a week later, all of us in the truck, headed toward the woman's place. This time with the trailer. It was a lovely day - bright and sunny, but the usual nervous excitement of picking up a new horse held a new anxiety for all of us. Of course my husband thought I was nuts to be taking on a potential liability like this. We couldn't afford it. We didn't have the room. Nancy was nuts, all right. He changed his mind as soon as we pulled in. Lech looked worse than we all remembered. In just a couple of weeks, he had dropped even more weight. It seemed like every bone in his body was visible. And that hock. It looked like a softball. We hurriedly loaded him. I tried to get the woman to sign a transfer document, but she refused, saying the horse didn't belong to her. By the time I climbed back into the truck the kids were in tears. "Mom," cried my oldest, "How could anybody let a horse get like that?" "I don't know, honey. But at least she had the courage to give him up, and that's something good," I said. Then I cried too. Now not only did we have to restore Lech's health, we had to prove he was the horse we believed he was. The vet and the farrier came out right away. The bad news: Lech had at least 100 pounds to gain, and the hock injury would not improve much. The good news: glycosamine might ease the joint pain, and proper nutrition and dental care could help put the weight back on. While Lech settled in, I got to work trying to piece together his past. My ultimate goal was to make a positive identification. Then I'd need to determine if Lech had been stolen, or lost. The Arabian Horse Registry helped me figure out who held the papers, but it was up to me to somehow locate and contact the person. 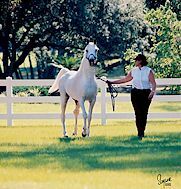 Several weeks later, in town for a show, Rick Moser, head trainer at Rojo Arabians, came by to see Lech. "He's got the Palas look, " Rick observed. "I would bet he's the right horse. If he is, what a story," Rick also informed me, as did almost everyone else who advised me along the way, that Lech was not alone. 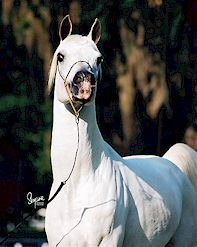 There were many fine and valuable Arabians out there who had come by similar fates after the market tumble. Although it must be true, that news seemed so hard to swallow. The process of determining if the Lech in our barn was the same as the Lech PASB on record with The Registry was like a chapter out of detective novel. We had to shave his forehead down to the skin to reveal the white markings he displayed at birth. The remaining star and hoof colors had to match what was on record. We sent a series of photos off to The Registry and waited. Finally a call came from Special Services at The Registry. "Looks like this is the right horse." The words rang in my ears. The lump grew again in my throat. I thanked them for their help. Now the task of getting Lech his papers back. The owner of record was a man named Jerry Vanier. I tracked him down to a business he owned in Scottsdale. A letter and several phone calls later, I finally made contact with the man who brought Lech and his dam to the U.S. so many years ago. No, he didn't own horses anymore. No, he wasn't interested in having the stallion returned to him. So we talked, me updating him on my end of the story, he filling in many of the missing puzzle pieces. Lech, he said, was indeed the victim of a bad debt. He was imported in-utero and sold as a yearling. The balance of the sale was never paid, and so Lech left his papers behind. A trip to court couldn't even settle the matter, and so Lech, worthless for breeding without his registration, was sold and resold, until eventually he ended up down and out. More than a dozen years had passed since his last foal was registered. Naturally Mr. Vanier thought it unfortunate that Lech had been suffering such a hard life. And so we made arrangements to transfer the registration. Lech PASB now had his name and identity back, and the opportunity to make his mark on the world once again. That was around Thanksgiving, a little over a month after Lech came into our lives. In the meantime, Lech was really flourishing. From the start he was a most welcome new addition to the clan. Lech was polite toward humans and very curious not only about the other horses, but was eager to greet everyone who came to see him. The first bath was a discovery process. I knew nothing about any shyness or sensitive areas, so I moved very slowly. The protruding ribs and hipbones made me feel like he'd break if I scrubbed too hard. Of course he was protective of his hock, but with extra patience, he eventually allowed the farrier and me to work on that hoof. I remember how it seemed as if Lech really valued this initial grooming and attention. He loves being fussed over and will even quietly put down his head for a good rinse with the hose during his baths. We started to see some positive changes in Lech's health and appearance about two weeks after he arrived. We owe so much to our vet, Jim Yanchunis. One of the first things he did was some extensive dental work. Lech's teeth had been neglected for an undetermined number of years. He needed all his immunizations, worming, and Coggins testing. But aside from the hock and severe undernourishment, Lech's body had somehow withstood the years of neglect. We chalked that up to his good breeding. Even with repaired teeth, Lech did not dive into his feed like I imagined he would. This was disturbing, but we decided it might have been that he was simply not used to eating. We built his appetite gradually, starting off with 10-percent pellets, steadily increasing the amount. After he was accustomed to that, we upped the protein content. Our vet also suggested we add a little bit of good old-fashioned corn oil to the feed, as well as a nutritional supplement. Along with good hay and of course his glycosamine, Lech was soon on the road to recovery. It was a funny thing, but I knew he was really making progress when I noticed his tail had begun to grow again. Lech had arrived with barely a wisp of a tail, and now shiny new strands of silky snow-white hair had appeared. Another small step, I thought. Today, seven months later, Lech is at a healthy weight. His eyes sparkle, his coat gleams in the sun, and he is a joy to be around. Lech trots and canters around like a frolicsome colt, flirting with the mares at every opportunity. He relishes any sort of attention and looks forward to brushing, bathing, and an affectionate rub on the head, muzzle and ears. There's so much I don't know about Lech's life during all those missing years. Some things I am sure I never want to know. What a story this magnificent horse could tell, if only he could speak. But I am content to communicate with him each day in the language of love and affection. Despite this growing bond, I know Lech has a purpose he cannot pursue with us, in our simple place. He possesses a very valuable and ready contribution to his breed. He needs to be in a place, a capable breeding facility, where his kind of potential can be maximized. 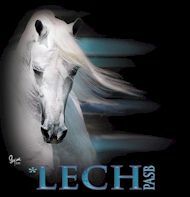 But wherever he makes his home, my true hope is that LECH PASB lives out his remaining years in peace, watching his foals carry on his good name. Final note: Lech PASB has 30 registered foals, ending in 1989, and 31 registered grand-foals as of this writing. 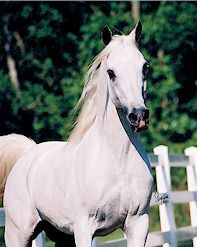 Some offspring were conceived in the intervening years, many by registered Arabian mares. Lech has been bred to one mare since regaining his registration. The arrival of that foal will mark the first registered foal for Lech PASB in fourteen years. 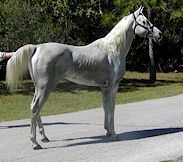 Nancy Ryan thanks the following people for helping her rescue and restore Lech's name and health: George Zbyszewski, Rick Moser, Jim Benedict - The Arabian Horse Registry, Jim Yanchunis, DVM, Emmett Stevens, Mr. Jerry Vanier, Sharon Sperte, Suzanne Sturgill, and especially Arabian Horse World Magazine.